Google Contact Sharing: 7 Tips on how to make the most of a Big Networking Event! 7 Tips on how to make the most of a Big Networking Event! The Gapps Experts team had the opportunity to attend last San Francisco Google Next 17’ and will be as well at the Tel Aviv Google Next 17’, this 10th of May! Connecting with awesome people through different events from all over the world, has intensified a lot of our growth over the years. When there are so many people attending an event, it’s always hard to avoid feeling overwhelmed as you wonder how in the world you’re going to come away from an event with meaningful connections. You may meet people at booths or panel sessions, and may only have a few minutes to get their attention. Make sure to announce in your social media and your newsletters, that you will be attending to such event, so that people that are interested, can request a meeting at the spot. If you’re aware of anyone of relevance might be going, contact them directly in order to let them know that you’ll be there too. Direct contact is always key, in order to consolidate existing relationships and bonds. Additionally, if your your contacts know more people at the event, they might introduce you to them! Get ready to acquire relationships and not a bunch of contacts for your CRM. You’ll might be collecting a lot of contact information at a big conference, but finding new connections for your address book isn’t the same as finding data to dump into your Contact Management Application or CRM system. You need to approach the event as if every connection you make has the potential to become part of your organization’s inner circle of key contacts. Take a more targeted “quality over quantity” approach and a spend time to meet specific individuals from specific companies.If you’re wondering who qualifies as a valuable contact, ask yourself first what is it that this person does and how is it connected or similar to what you do. Making your own Google Contact Groups is easy. You do it also when you want to share your contacts with other users. So make a list of the type of connections you would like to acquire, and turn those lists into groups at your Google Contact Manager. For example, if you’re trying to meet potential partners,customers or influencers you can create those groups and add the meaningful contacts you get on the way. You should also tag any existing contacts you have that fit into those categories so you can stay always organized. Don’t forget to share your new acquisitions, with the rest of your team so you can pass tagged contacts to each other and collaborate on follow up! 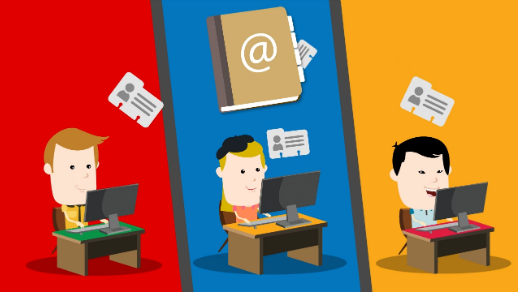 Tip no.4: Social Networks are your best weapon! Conference or event hashtags attract a lot of posts and conversations, but shouting to the masses will not be very effective. 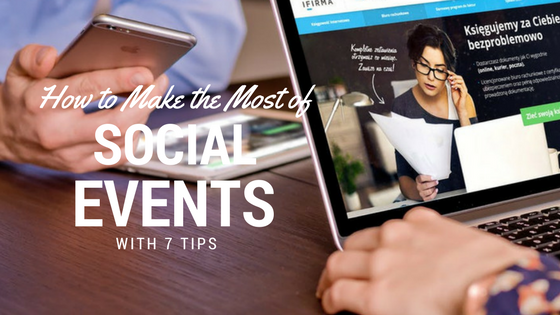 Instead of treating an event’s social feed as an advertising platform, make it a part of your target groups and tags strategy and reach out to people directly. One common mistake for networking events is to simply harvest business cards. This is counterproductive, as at the end of the day we might not know who these cards belong to, either what was spoken or the point of it. When I say you have to collaborate, I mean that your team should constantly join forces in your lists of contacts in order to get the best of the best, when it comes to people. You can use Google Sheets in order to input all your new contacts or simplify your life even more by using Shared Contacts for Gmail® to add your contacts on the go. Remember that a single individual can’t have “full coverage”. But most importantly, don't just slip those business cards in your pocket for later! Tip no.6 : Have something to offer. Be helpful. Businesses make money when they help people get what they need. So start engaging with people you have never met with a “willing to help” attitude. Ask them, “what can I assist you with?” You’ll not only be able to help a lot of people, but you’ll also get a lot of people responding with the same question and their gratitude! Follow. Up. Always. I can’t stress that enough. Take one full day to make a personal email to each contact, after reading the notes you took about them and orienting the email according to this note. Always propose a next step.When you do not keep in touch with your new connections, they continue to move on. Therefore, in order to reach the full potential of that acquisition, you must keep in touch with your new contacts!